One of the most sought-after Turkish popular musicians of our time..
LIVE IN SYDNEY for 1 night only performing with his full band at @ The Entertainment Quarter, Max Watt’s on Saturday, 15th December 2018!! 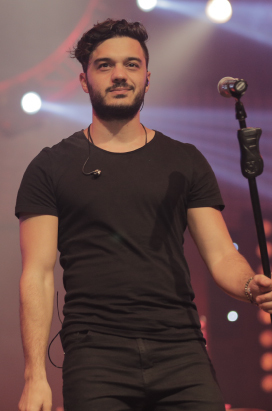 Making his mark on X Factor Türkiye followed by a string of smash hits including İçimdeki Duman, Gel Be Gökyüzüm, İncir, Sadem & several more, İlyas Yalçıntaş is also renown for his covers repertoire and captivating live performances. Guest DJ Ilker Aydin from Halikarnas, Bodrum, DJ Goksel Ada, and new Turkish funk band FUNKATOLIA will be on hand for a pre-show Summer Turkish Vibes Sydney Club Experience !! General Admission (Over 18) – Ground level standing. General Admission (Under 18) – Mezzanine level standing, non-alcohol bar. Unreserved seating. Avoid the queues and get your tickets in advance!! VIP Meet & Greet Package $150 Tickets are sold out. Early Bird - General Admission $75 Tickets are sold out. Early Bird - General Admission (Under 18) $75 Tickets are sold out. VIP Sponsor Package $250 Tickets are sold out.